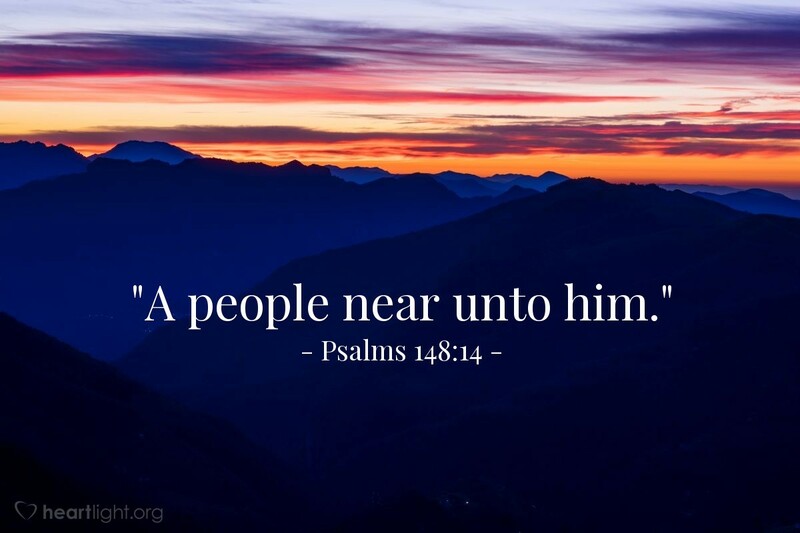 "A people near unto him." The dispensation of the old covenant was that of distance. When God appeared even to his servant Moses, he said, "Draw not nigh hither: put off thy shoes from off thy feet"; and when he manifested himself upon Mount Sinai, to his own chosen and separated people, one of the first commands was, "Thou shalt set bounds about the mount." Both in the sacred worship of the tabernacle and the temple, the thought of distance was always prominent. The mass of the people did not even enter the outer court. Into the inner court none but the priests might dare to intrude; while into the innermost place, or the holy of holies, the high priest entered but once in the year. It was as if the Lord in those early ages would teach man that sin was so utterly loathsome to him, that he must treat men as lepers put without the camp; and when he came nearest to them, he yet made them feel the width of the separation between a holy God and an impure sinner. When the gospel came, we were placed on quite another footing. The word "Go" was exchanged for "Come"; distance was made to give place to nearness, and we who aforetime were afar off, were made nigh by the blood of Jesus Christ. Incarnate Deity has no wall of fire about it. "Come unto me, all ye that labour and are heavy laden, and I will give you rest," is the joyful proclamation of God as he appears in human flesh. Not now does he teach the leper his leprosy by setting him at a distance, but by himself suffering the penalty of his defilement. What a state of safety and privilege is this nearness to God through Jesus! Do you know it by experience? If you know it, are you living in the power of it? Marvellous is this nearness, yet it is to be followed by a dispensation of greater nearness still, when it shall be said, "The tabernacle of God is with men, and he doth dwell among them." Hasten it, O Lord.